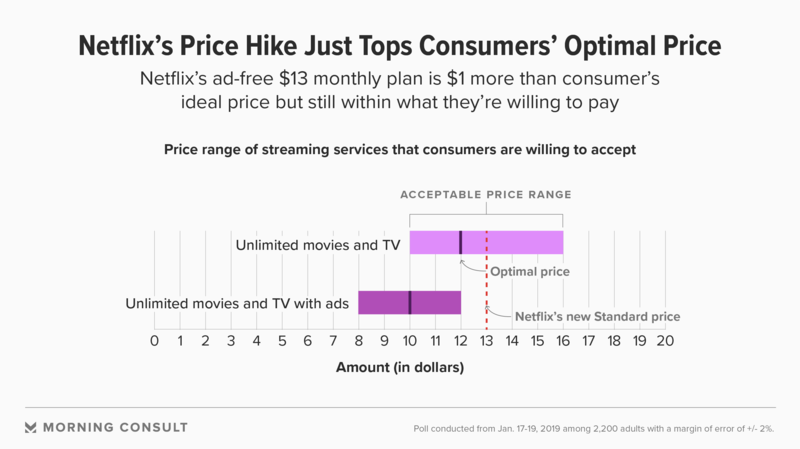 $12 is the optimal price for a streaming service that offers unlimited television shows and movies with no ads; the optimal price for ad-supported streaming platforms is $10. 20% of adults have seen, read or heard a lot about Netflix Inc.’s recent decision to increase prices from $11 to $13. The streaming market will likely be getting more crowded in the coming years, with services from The Walt Disney Co., NBCUniversal Media LLC and AT&T Inc. all set to launch before 2021, possibly forcing established players including Netflix Inc. and Hulu LLC to change their pricing amid a competitive field. And new polling shows that there may not be much room to adjust prices without leaving the optimal price range for consumers. A Jan. 17-19 Morning Consult/The Hollywood Reporter survey of 2,200 adults found that a range of $10-$16 a month was considered a good price point for consumers when it came to paying for ad-free streaming services, while $8-$12 was the range for services with ads. Analysis using the Van Westendorp model, a model that finds an optimum price point for a good or service by considering what prices consumers believe are “too expensive” and “too good to be true,” found that $12 is the optimal price for services that offer unlimited movies and television shows, similar to Netflix. For services similar to Hulu, which offers unlimited television shows and movies with periodic commercial breaks, $10 was the optimal price. Netflix and Hulu have both recently changed their pricing. Twenty percent of those surveyed said they had seen, read or heard “a lot” about Netflix’s announcement earlier this month that it would be increasing prices, with its most popular plan rising from $11 to $13 per month — above the ideal price determined by the survey but still within the range consumers considered a good price. Hulu also recently announced pricing changes — dropping the price of its ad-supported plan from a monthly charge of $7.99 to $5.99, which is nearly half the amount of the survey’s optimal price. The ad-free plan will remain at $11.99, while the monthly cost of its streaming and live TV service combo is set to increase by $5 to $44.99. Hulu did not respond to a request for comment. Get the latest news, data and insights on the entertainment industry. According to Myles McNutt, an assistant professor of communication and theatre arts at Old Dominion University, these pricing changes serve different purposes: With higher subscription costs, Netflix is able to increase revenue as it increases its production costs, while Hulu’s changes are both a way to attract new customers and a way to satisfy customers used to a traditional television viewing experience as more options for streaming and cord-cutting become available. McNutt noted that established services such as Netflix and Hulu are setting the value of streaming services, which will give them power when it comes to determining prices in a more competitive marketplace. “What you have now are companies with increasingly valuable content libraries — a big reason for why Disney is buying Fox — who are trying to monetize that content, but at the same time appear competitive and attractive to consumers who may be resistant to another subscription,” McNutt said. The impact on prices is uncertain but will likely change after the forthcoming streaming services’ debut. There are also free, ad-supported streaming options that are gaining traction: Viacom Inc. recently purchased a free, ad-supported streaming platform, Pluto TV, for $340 million in cash while in August, Roku Inc. launched a free online version of The Roku Channel previously featured exclusively on its streaming device. Sarah is a reporter at Morning Consult covering the business of entertainment.